Uglies told Tally Youngblood’s version of life in Uglyville and the budding rebellion against the Specials. Now comes an exciting graphic novel revealing “new” adventures in the Uglies world – as seen through the eyes of Shay, Tally’s rebellious best friend who’s not afraid to break the rules, no matter the cost. A few months shy of her sixteenth birthday, Shay eagerly awaits her turn to become a Pretty – a right of passage operation called “the Surge” that transforms ordinary Uglies into paragons of beauty. Yet after befriending the Crims, a group of fellow teens who refuse to take anything in society at face value, Shay starts to question the whole concept. And as the Crims explore beyond the monitored borders of Uglyville into the forbidden, ungoverned wild, Shay must choose between the perks of being Pretty and the rewards of being real. I haven’t touched the Uglies series since I was at school where I read it three times and I do still check Scott Westerfeld’s website quite frequently. So when I saw that a graphic novel (I simply adore graphic novels) was to be released about Shay, I nearly hit the ceiling. I have immediately added this to my TBR list and I will definitely buy it as soon as it is released (unfortunately, I can’t win a copy because I don’t live in the US). What new books are you waiting for? 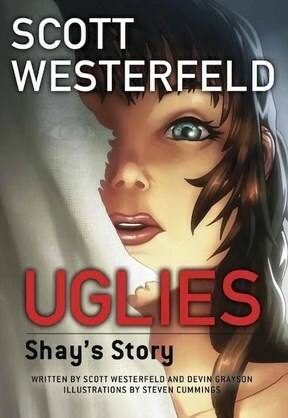 I loved the Uglies series. I was really excited when i saw this was coming out soon! Great pick!